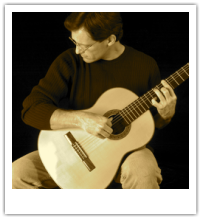 Guitar Elegance is the ambiance created by Jim Lammers performing solo guitar music at your special event. Jim will welcome the opportunity to perform for your wedding ceremony, reception, or celebration of any special occasion. His extensive repertoire is suitable for all general audiences and enhances the social component of special business functions including: promotions, client appreciation, service and product awards ceremonies, business expansions, retirement parties, holiday parties, seminar and convention entertainment. Jim Lammers is a professional musician based in Kansas City. For more than 25 years, he has enjoyed performing throughout Kansas and Missouri. His solo guitar engagements have included public functions and private receptions of all variety. 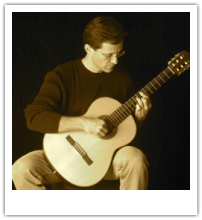 His fingerstyle guitar artistry consists of Popular Standards, Traditional Classical, and Christmas Holiday selections. Contact Jim now to schedule a performance that complements your special occasion. Solo guitar performances for all of your special occasions & events. 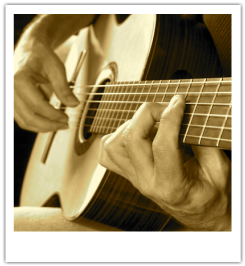 Solo guitar music is elegant for both large & intimate ceremonies.